7/1/13 - Acquisitions - Washington, National Gallery - Thomas Moran has definitely found his place at the National Gallery which, after receiving a donation of two of his paintings, recently acquired a watercolor from 1890 representing the Mountain of the Holy Cross (ill. 1). This Rocky Mountain peak in Colorado, is known for the cross seen on one side and for the legend rising from it by which this was God’s sign blessing the settling of the West. Thomas Moran depicted it in 1875 in a famous canvas, today residing in Los Angeles at the Autry Museum of Western Heritage. He added a waterfall to underscore the mythical landscape dear to many Americans in an attempt to capture "the true impression" of the scene rather than a topographical reality : "I place no value upon literal transcripts from Nature. My general scope is not realistic ; all my tendencies are toward idealization... Topography in art is valueless.". The watercolor acquired by the National Gallery is unpublished ; it was commissioned by Caroline Phelps Stokes and remained in the family for almost a hundred years ; it was still unknown in 1997 when the Museum organized a Moran retrospective and was never presented to the public. The Museum also holds an engraving from 1888 representing a similar landscape by this artist who is often associated with the Hudson River School. 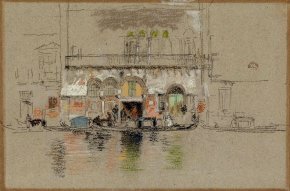 From steep mountain paths, we move on to the canals in Venice with a pastel (ill. 2) which Whistler produced during his stay in the city between 1879-1880 in response to a commission from the Fine Art Society for a series of etchings. White and Pink (The Palace) seemingly represents the Ca’ da Mosto. The drawing, still in its original frame, was purchased by the American collector Louisine Havemeyer. It came up for auction in New York at Doyle’s on 9 May 2012, estimated at $150 to $200,000 and in fact soared to a record $650,500 (including charges). Another 19th century work, a painting by the Dutch artist, Hendrik Willem Mesdag, Sunset at Scheveningen was purchased from the Bob Haboldt Gallery (ill. 3). This view of the sea from The Hague can be found in several of his other works, for example the Rijksmuseum owns a scene showing it closer up, but also less luminous with the characteristic flat bottomed fishing boats. The artist, who won the Gold Medal at the Salon of 1870 in Paris for Breakers of the North Sea today residing at the Van Gogh Museum in Amsterdam, was also famous for the Mesdag Panorama produced in The Hague in 1880-1881. An avid collector, notably of 19th century French paintings, he was behind the museum bearing his name in The Hague. His painting will join another one at the National Gallery by an artist from The Hague School, Jacob Maris, entitled A View of the Mill and the Bridge on the Noordwest Buitensingel in The Hague (1873). Some older works have also joined the museum collection : for instance, Saint Luke and Saint Mark painted by Giorgio Vasari in 1570-1571 for Pope Pius V. These two paintings on panel are currently undergoing restoration and we do not have good photographs. They were donated by Damon Mezzacappa to the National Gallery (ill. 4). 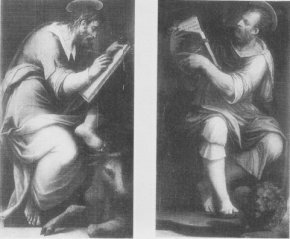 The two other evangelists, Saint Matthew and Saint John reside in the chapel of San Sebastiano in Livorno. Finally, the portrait in black chalk of a man with a hat bears an inscription on the back : "Gio : Van den Enden da Brussel Pittor" (ill. 5). 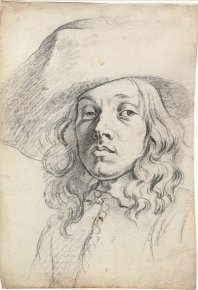 When auctioned off in Auxerre on 6 March 2011, it had been presented as a drawing from the 17th century Northern European school ; today, the National Gallery is proposing an attribution to Michael Sweerts, a painter for whom there were no acknowledged drawings until now.